Chad Crinkle Crawford’s first feature Jug Face is a film that plays it low key despite the fantastical and ‘out there’ subject matter. Showing the audience everything on face value, the reason and theories and beliefs are left up to the audience. A film about blind faith and the path it leads too and what happens when that faith is challenged or shunned altogether. 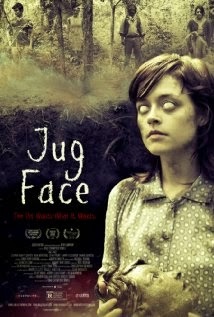 The basic plot outline for Jug Face involves a backwoods community who worship a pit with apparent healing powers. The community potter (Sean Bridgers) creates jugs with faces from clay, and when a jug portrays the face of a member of the community, that person must then be sacrificed to the creature that lives in the pit. 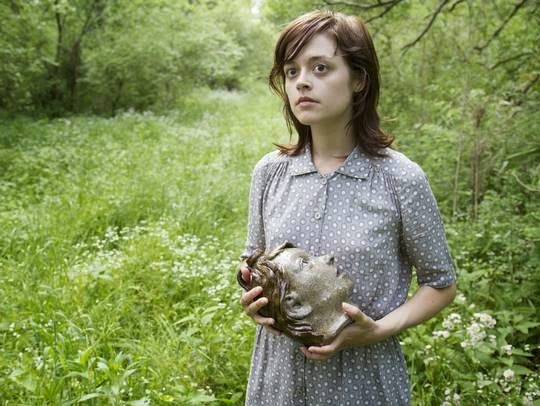 When Ada (Lauren Ashley Carter) discovers she is pregnant and at the same time she finds her likeness on a jug she hides the jug. After this Ada’s community begins to be taken by the pit. As strange as that sounds it works perfectly within the confines of the film. The acting is just flat out great. Carter and Bridgers give their best performances, probably ever and Larry Fessenden is outstanding and has yet to disappoint. The rest of the cast is just as good with Sean Young as Loriss in particular she is very fierce and angry as Ada’s mother. Crawford’s direction is very good, taking on some fast panning shots reminiscent of The Evil Dead. He manages to capture the outdoors but still manages to keep you knit tightly into the community. I have a slight issue with the spirit that makes itself known to Ada (don’t worry it’s not a spoiler) it seemed a tad generic but in all honesty it doesn't take away from the film. Crawford’s writing is terrific, once the story gets moving and you get a sense of what is happening, the dialogue is great and is one of the reasons the film works so well, just like his directing Crawford keeps you in the community with his writing, illustrating how isolated both physically and socially the community is. Being thrown into the middle of this belief system takes a while to get used to. You are playing catch up constantly, trying to ascertain how certain things came to pass but I think that is the beauty of Jug Face; nothing is spelt out clearly for you. The idea of sacrificing people to appease gods or rulers is nothing new and in Jug Face it is just commonplace because that is the way it has been and it hasn't been questioned, it is just believed. The ending of Jug Face was interesting for me. At first I utterly disliked it and felt cheated. However after thinking about it and placing it within the context of film, I now think ending is pretty much perfect and there would be no real other way to end the film. Jug Face is a great film from a great new talent and I can’t wait to see what else the director comes up with in the future.